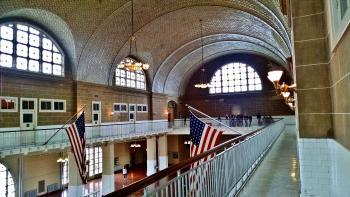 Ellis Island is part of the Tentative list of USA in order to qualify for inclusion in the World Heritage List. Ellis Island has been an entry point for over 12 million immigrants to the United States over the course of 60-plus years. The descendants of those immigrants nowadays make over 40% of the population of the USA. My wife's family name can be found on the Wall of Honor on the island. Ellis Island can only be visited on a combined ticket together with the Statue of Liberty, and quite a lot of people give it the short shrift, spending the bulk of their time on Liberty Island. Those who decide to budget time for Ellis Island quickly realize that even a few hours may not be enough for seeing and learning all there is to see and learn. The audio guide - included in the ticket price - has over 120 hours of narration with nearly 2000 stops across half a dozen exhibitions and general areas. I suggest budgeting at least 3 hours, which will allow you to take a look at all major aspects of the site and explore one or two areas in depth. It is not about visual impact so much - although the Great Hall is definitely visually impressive - but rather about myriad of details and circumstances that featured in the processing of arrivals from all over the world. It is a fascinating experience for any student of history or anyone with their own history of immigration, although I can understand how someone with no emotional connection to this topic might not find anything exceedingly impressive here. Given that Ellis Island can only be visited on that combined ticket, it seems a bit odd that one day the island and the statue may constitute two individual WH sites. In addition to proximity to each other, the two are emotionally intertwined, as Lady Liberty greeted the arrivals in the harbor, heralding the start of their new lives, before they found themselves deposited at the processing center on Ellis Island. I will not be surprised if Ellis Island is eventually enshrined as an extension of the existing Statue of Liberty WH property. From where I stand, it is clearly worth the recognition. 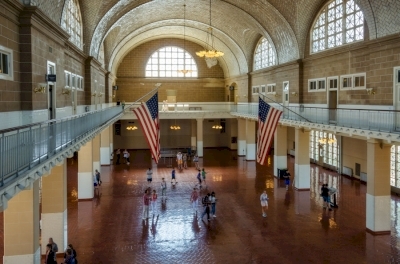 Most visitors will visit Ellis Island as part of their ferry trip to the Statue of Liberty. Unfortunately, for many visitors it seems like Ellis Island is an afterthought. However, for the countless Americans who had family arrive to the United States between 1892 - 1954, Ellis Island is an important pilgrimage. In fact, 12 million immigrants entered the United States through Ellis Island. My visit was on an overcast day, with sprinkling rain, March 2015. I was excited to see the island and immediately made my way to the museum, which provides a window into immigration at the turn of the 20th century, it is much different today in 2017! I would love to tour the Hospital Complex, which is largely in disrepair, though restoration work is in the long term plans. My Great-Grandfather immigrated to the United States and was processed at Ellis Island March 12th, 1909. He travelled from his home in Öland Island, Sweden to Liverpool, England. From there the ship (Mauretania) took him across the Atlantic to Ellis Island. He was 21 years old. Thinking back, the Statue of Liberty and Ellis Island both stand out as a worthwhile trip, which has special meaning for many Americans and the families of immigrants that remained. As world heritage, I feel the Statue of Liberty and Ellis Island have enough difference in criteria to merit separate status.